We are used to boiling rice in the western world and usually we consume it straight away, but we are not used to cooking the rice and use it for stir frying purpose. I struggled in the past to cook fluffy non-sticky rice until someone taught me how to do it. So pay close attention since am also going to share this knowledge with you. cook the rice through but don’t overcook it! add a few drops of vinegar to the cooking rice in the pot, it will help in keeping the rice fluffy because the vinegar washes away the starch from the rice grain and starch is causing the rice to stick together. The small amount of vinegar won’t affect the flavor of the rice. Use cold rice from the fridge to make fried rice. The cold rice won’t make your fried rice mushy because rice tends to dry in the fridge and that’s what we need for the stir-frying. Stir fry with high heat and keep the content moving by adding in ingredients one by one. 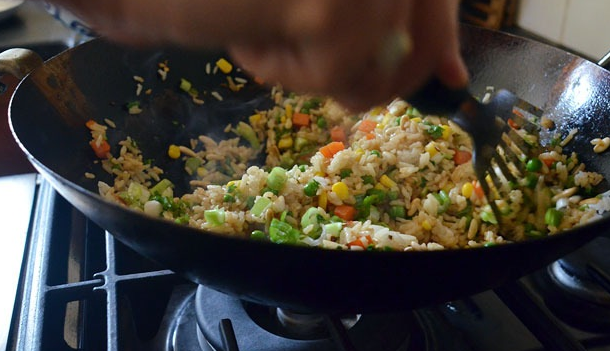 Cooking fried rice from the beginning to the end should not take more than 10 minutes. Always add vinegar to your sauce because the vinegar in your sauce will not only give the taste but also keep your rice fluffy. 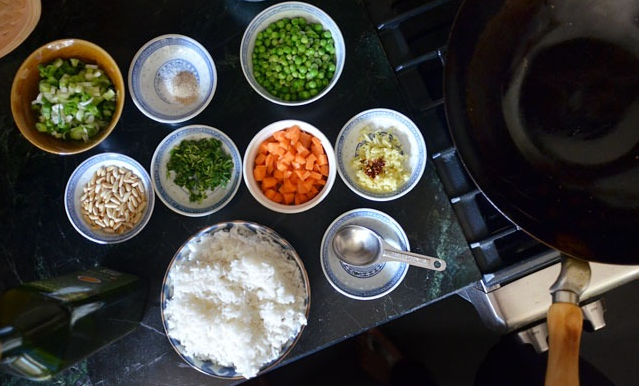 If you follow these steps you will be able to make the best-fried rice with ease. It’s actually all about the technique and the rice type and I think you can do that too! The most important key to making a good stir-fry is cutting each ingredient to a uniform size as specified above. Cut the aromatics as directed and set them aside in a bowl. Finely slice, then mince, the ginger. Don't grate it on a grater. Cut the vegetables and set them aside as well. Set the bowls of vegetables, aromatics, rice, and soy sauce near your stove. Also, have a very small bowl of water next to the stove. Turn on a stove burner, as high as it will go. Set the cooking pot over this high heat burner. To determine when the cooking pot is hot enough, start flicking droplets of water from the small bowl into the pan after 30 seconds. As soon as a bead of water evaporates within 1 to 2 seconds of contact, the cooking pot is heated and ready for stir-frying. Do not overheat the cooking pot though. With the cooking pot back over the heat, add the ginger and red pepper flakes and stir-fry for 10 seconds or until fragrant. Add the carrots and stir-fry for 30 seconds, or until the carrots are bright orange. Add the corn and peas and stir-fry for 1 minute. Swirl the remaining tablespoon of oil into the cooking pot. Add the rice and scallions stir-fry for 2 minutes, breaking up the rice with the spatula until it is heated through. Season the rice with the salt and white pepper. Pour the soy sauce around the edges of the cooking pot and stir-fry with vinegar. Stir in the cilantro.